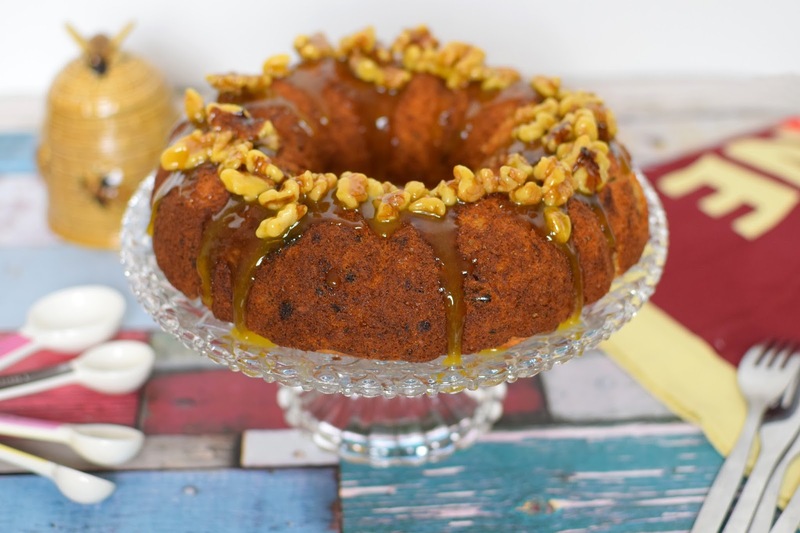 You know those days where you have the urge to bake and just have to raid the cupboards and cobble something together, this ended up with me making a banana date cake with a walnut honey glaze! I always neglect my bundt tin, I'm desperate for a one with a fancy design, but haven't found one that isn't super expensive yet! So the bundt tin was whipped out and this is the result! I honestly don't think I know anyone who doesn't like banana in a cake, it's just right! I'm not one to use dates too often, they're a bit foreign for me but they do add just that something extra here. On thing I will say is definitely definitely make the glaze! It's to die for! 1. Preheat oven to 160C/140C fan/gas 3. Grease an 18cm bundt tin and set aside. 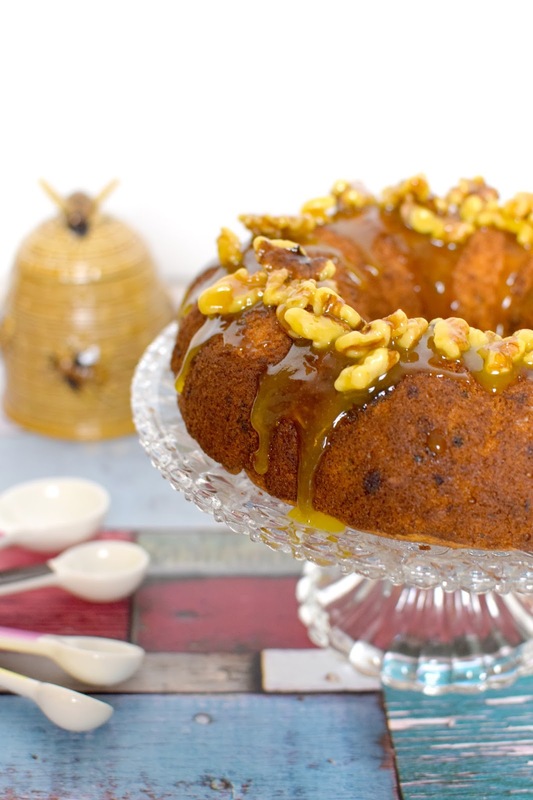 Put the flour, cinnamon, butter, sugar, eggs and honey in a large mixing bowl and beat with a wooden spoon or hand-held electric mixer until light and fluffy. 2. Mash the bananas and chop the dates. 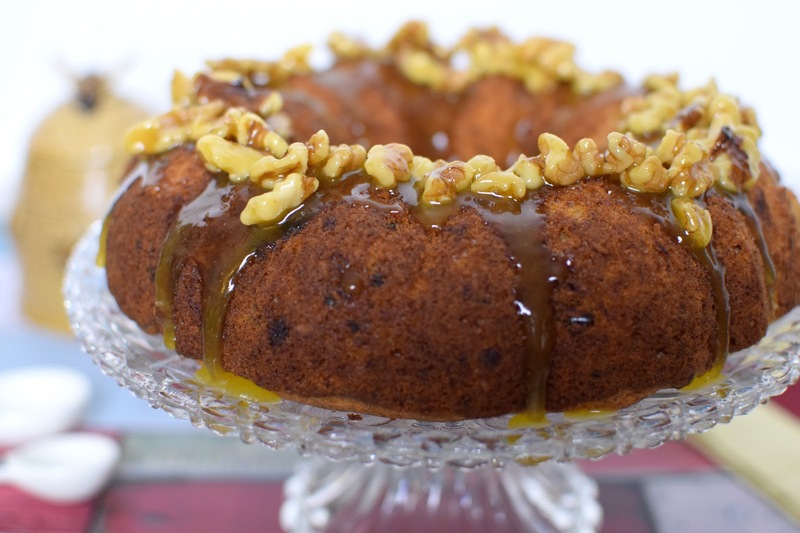 Stir into the cake mix with the walnuts. Spoon into the prepared tin and smooth the top. Bake for 40-50 mins until firm to the touch and a skewer inserted into the centre comes out clean. Cool in the tin for 30 mins, then turn out and cool on a wire rack. 3. To make the glaze, put the honey and butter in a small pan and bring to the boil, stirring until the butter has melted. Boil briefly, about 1 min, until slightly thickened. Remove from the heat and stir in the walnuts. Leave to cool until thickened and opaque. Spoon over the top of the cake and leave to set.